The Dubbo Zirconia Project (DZP) comprises the development, mining and processing of zirconium, niobium and rare earth element resources located near Toongi, approximately 25km south of the town of Dubbo. OzArk EHM carried out both archaeological and ecological impact assessment for a 2,500 ha study area, with an 800 ha impact footprint. This information was used for the Environmental Impact Statement required for development approval. 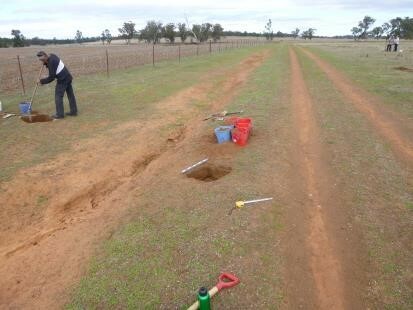 The heritage fieldwork component included surface survey and test-excavation, and required 90 person days. Representatives from the Registered Aboriginal Parties attended the fieldwork. 52 sites were identified in the study area, 33 of which were newly recorded. OzArk was involved with all aspects of assessing the scientific values, from field work through to numerous meetings with Aboriginal stakeholders, the project team and government regulators. OzArk was able to provide a detailed set of recommendations for this large study area that met the requirements of the government regulators and the approval of both the proponent and the Registered Aboriginal Parties. One finding from the initial ecological fieldwork was the presence of the threatened species “Pink-tailed Worm-lizard” Aprasia parapulchella . OzArk has now designed and implemented an on-going monitoring plan for the Pink-tailed Worm-lizard prior to the construction and operation of the mine. This will allow translocation to occur for specimens found within the mine impact zone. Annual monitoring occurs after appropriate weather conditions are present. In-conjunction with the Pink-tailed Worm-lizard monitoring, OzArk has begun monitoring the vegetation in the same sites to determine any association with vegetation structure and presence/absence of the species. OzArk continues to work closely with the client to determine the best monitoring options available to meet approval requirements. Posted on February 18, 2015 by Jane.